Aircrafts are equipped with an array of lights that are used for navigation, safety, and to improve visibility during flight or when taxiing on the ground. There are two typical types or aircraft light beings used for aircrafts, these are the warning and landing lights. Aircraft warning lights are high-intensity lighting devices that are attached to tall structures and used as collision avoidance measures. It makes the structure to be more visible to the aircraft and is typically used at night, however, in some countries they are also used in the daytime. They must have adequate brightness that should be visible for miles around the structure. Landing lights are lights used on aircraft to light up the terrain and runway ahead during takeoff and landing. Almost all modern aircrafts are outfitted with landing lights if they are planned and approved for nighttime operations. Key considerations in the blueprint of landing lights are intensity, reliability, weight, and power consumption. Specific types of aircraft lights are Navigation lights, Anti-Collision Beacon lights, Strobe lights, Logo lights, Wing lights, Taxi lights, Landing lights, Runway Turnoff lights, Wheel Well lights. Major manufacturers of aircraft lights are GE and Honeywell. Honeywell Lighting and Electronics has uses high-brightness LEDs in its Astreon aircraft position lights, which have been flying since December 2003 on business jets. Boeing has selected Honeywell's Astreon LED systems for flight-critical exterior lighting on the 7E7 Dreamliner aircraft. Honeywell's Astreon products have been tested to 20 times greater life than traditional lights and carry extended warranties. 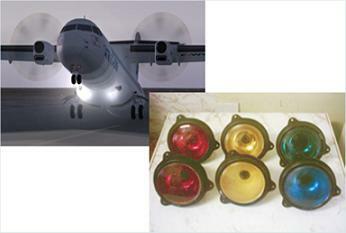 For specific list of Honeywell aircraft lights that we cater, please click on the link below.